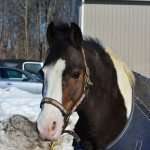 Description: Born in 1999, Spot is a medium-sized pinto pony. She stands out in a crowd with her striking brown and white patches. Her pink nose and stylish Mohawk mane also add to her unique appearance. Personality: Spot is perfect for all schooling levels. She loves being groomed and fussed over by our younger Troopers, and she also enjoys flying around a jumping course with our more advanced students. History: Spot came to Troop in 2014 after a successful show career. She was brought to NCMT by a former Executive Director who just knew Spot would be perfect for our programs!.